The Tigers impressed me so much not only with their comic strips, but how they can clearly show emotions in their drawn characters! 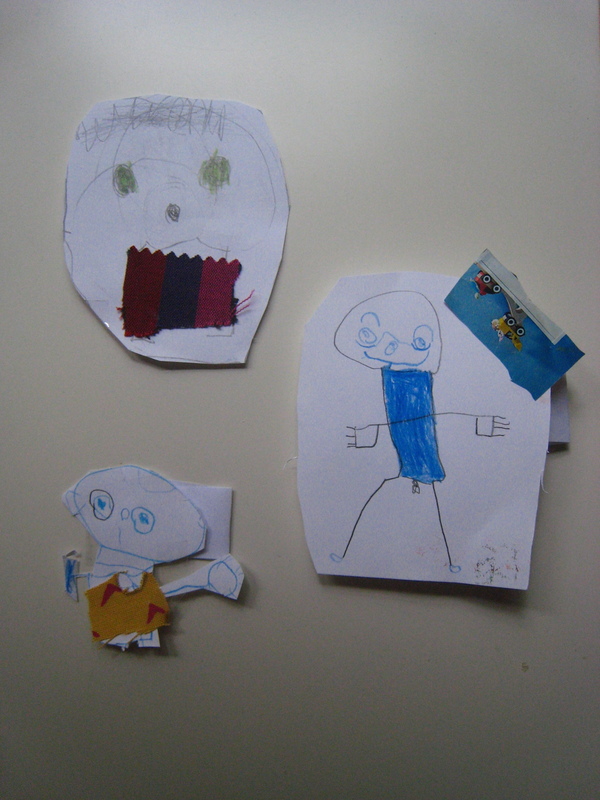 We first made some character studies from one of the characters in their character. For example, since Paavo was the main character in his comic he decided to do a character study of himself. He drew what he looks like happy, sad, nervous, and even drew himself as if he was going to explode from an oversupply of energy! Everybody did a wonderful job! The Mice in Vietnam will enjoy reading these during their summer holiday too! These profile self-portraits are like a mirror image of the artist! The Tigers did a wonderful job with their Light Works and had fun experimenting with this new technique. Wow! Aleksi did a spot on job recreating his hair! His self-portrait had equally spiky and spunky hair as in real life. Nachu said she was trying to draw her skin color. Jonatan had a wonderful revelation when he put the yellow gel over the blue picture. He realized that blue + yellow = green. I'm happy that everybody had fun :). Now for our Mice, we wonder what time does the sun set in Vietnam? Sending light to our friends in Hanoi! First we were all surprised, interested, curious and sometimes even scared of the paintings we saw: M. C. Escher, Salvador Dali, Pablo Picasso and other surrealist painters, which made us think a little bit and also realize that painting has no boundaries. Then, we started painting to Jun Miyake's "Lillies of the Valley". The storm, No teacher, Windy day, The tree, Flowers, Birds of Vietnam or the galaxy are some of the paintings we created. Take a look and you will find much more. 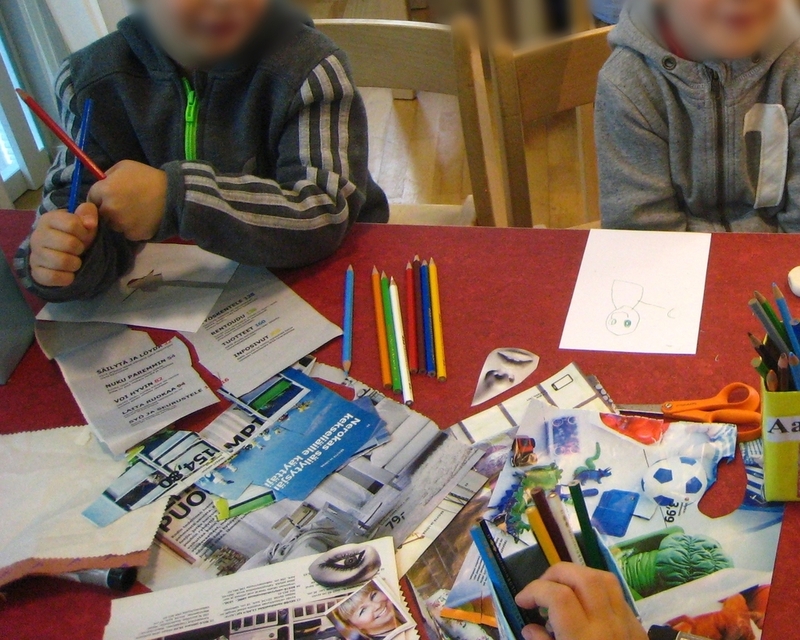 The Little Mice are exchanging with the Tigers in Espoo, Finland. Check out what The Tigers did for their Musical Paintings here! Not only are the Tigers sweet, but they have a sweet tooth and sweet sense of humor! It was fun talking with them about what kind of candy they like and when they give candy to their friends and families. Aleksi likes Salmiakki like a good Finn! I'm not too sure if their friends in Vietnam can even imagine what Salmiakki tastes like! Toti, that's going to be an interesting challenge for you to explain :). This topic started some great stories on the candy bags they sewed together. For example, Vilma said, "I drew raining lollipops!" Ida and many of the other Tigers drew ice cream and cookies for their friends. Using autumn leaves the Tigers picked up from the forest adds a beautiful touch to their artwork too! This was the first time The Tigers practiced writing their new friend's names on their bag. I'm sure everybody is excited for their next meeting on Skype! The Tigers are Rrrrready for their Ipevo Skype session with Just Kids in Hanoi! I learned so much about the Tigers today! 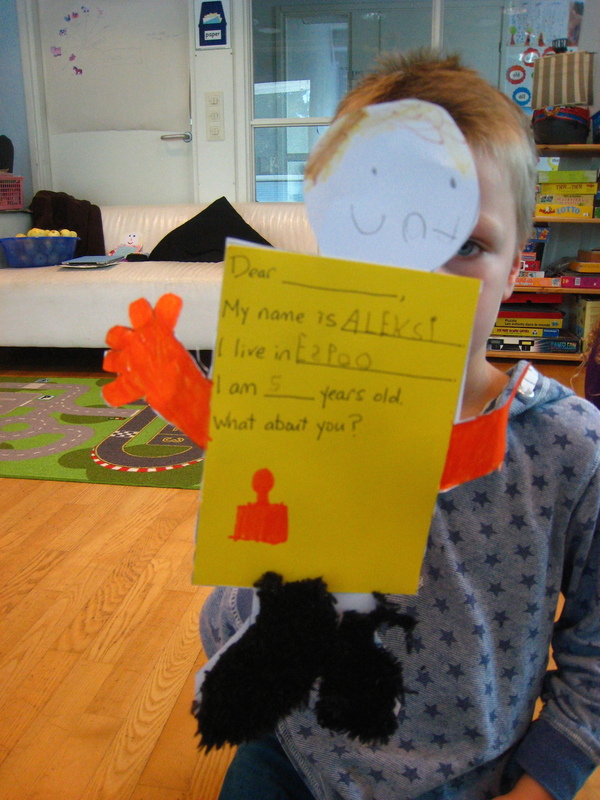 I learned that Aleksi likes to play chess because he drew a chess piece on his self-portrait puppet. I also learned that Sofi loves the color purple because she gave herself a purple dress. Now their new friends in Hanoi, Vietnam will also get to know them! Before we got ourselves covered with glue and markers I first showed them different portraits of artists such as Frida Kahlo and Pablo Picasso. This got our mind in the frame of choosing what we would like to tell our new friends about ourselves. Nachu said, "This puppet is the real me and not the real me!" On Friday they will have their first Dear You Skype session using the Ipevo document camera and conference station. Exciting!